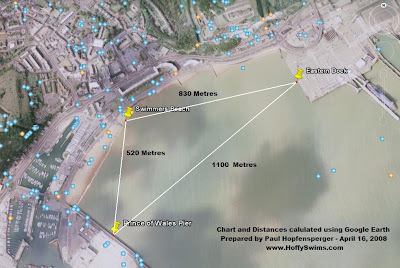 Above: Approximate Dover Harbour swim distances, courtesy of Google Earth, April 2008. 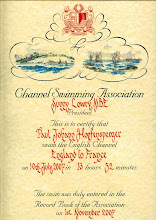 This Saturday, May 03, 2008 at 10.00am a small group of experienced channel swimmers, and 2008 channel swimming aspirants will descend on "Swimmers Beach" in Dover to be greeted by the Channel General, Freda Streeter, and to dip their bodies into the icy waters of Dover Harbour for the first swim of the 2008 open water season. All being well, I will be one of those swimmers. It will be good to be back in Dover to see both familiar faces, and new ones. I wish everyone good fortune, and hope their dreams come true this summer. If you listen to Freda, and do exactly what she tells you, I can assure you from personal experience, they will! Which brings me onto the next story. 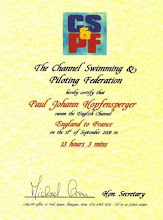 My two-way channel swim is booked for the tide of September 06 - 13, 2008. In swim terms that's 19 weekends of ploughing backwards and forwards across Dover Harbour in the pattern shown above. Last week, when thinking about it, I thought it would drive me mad, and so telephoned the "King of The English Channel", Kevin Murphy. "I need to do another swim this summer or I'll go mad!" I said to him. "I know exactly what you mean". He replied. After discussing several options, he mentioned Jersey to France, because it had only been done 10 times before. What's more, Kevin said that he hadn't even done it! Above: Approximate Jersey to France Route, courtesy of Google Earth, April 2008. 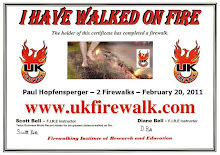 After putting the phone down, I telephoned Charlie Gravett in Jersey, and before I knew it, I had a swim booked, flights booked, and the swim was on! 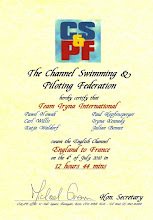 So now I am booked in for a France to Jersey swim at position number two on the tide of August 10 to 13, 2008. 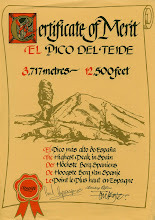 It is possible that I will go on August 11, 2008 which is Beccy's birthday! 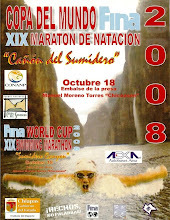 As I write, the swim has only been done by 10 swimmers to date, but there are 4 swimmers attempting it before me. 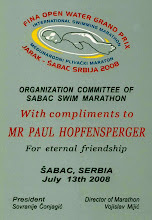 If we all succeed, then I will be the 15th person in history to achieve the swim. More info can be found at www.jerseyseaswims.org. "You can do it if you believe you can".